2nd International Conference on Islamic, Education and Law (ICIEL, 2018) will be held on 14th – 15th April 2018 in Hotel Perdana, Kota Bharu, Kelantan. In 2017 the 1st ICIEL 2017 was held on 1st – 2nd April 2017 in the AnCasa Resort, Port Dickson, Negeri Sembilan and the theme covered in this year are Islamic, Education and Law. But, for 2nd ICIEL in year 2018, more theme and sub-theme will covered such as Business Management, Accounting, Communication, Social, Economic, Tourism and Information System and Technology Management. This theme expansion can offers a collaborative environment to more academicians, researchers and practitioners to exchange and share their experiences and research results on all aspects of social sciences. The conference will also provide a platform for the intellectuals from various fields and disciplines in social sciences to debate and discuss the current issues worldwide as well as finding solutions to the problems. 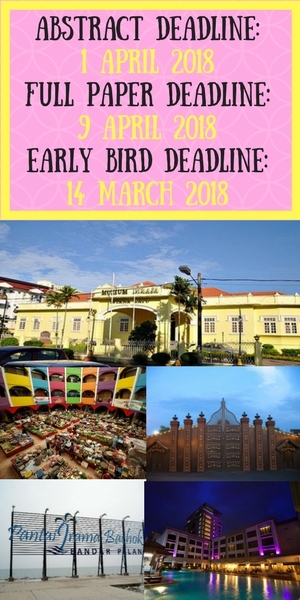 This conference was organize by Global Academic Excellence (GAE) and there are another five (5) upcoming conference for year 2018 that will be held in various location which are Melaka, Penang, Langkawi, Putrajaya and Sabah. GAE also provide several academic services such as academic training and workshop, academic consultancy and journal publication. For more information on GAE, please visit GAE website which is www.egax.org.